RayBio® Human I Mouse Phospho-ULK1 (S556) and Total ULK1 ELISA Kit. 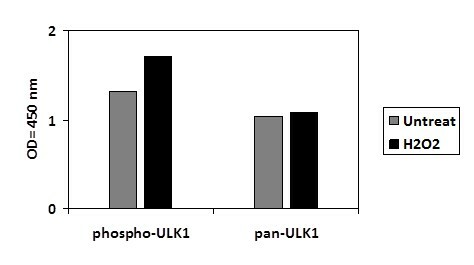 This assay semi-quantitatively measures ULK1 phosphorylated at Serine-556 as well as total ULK1 in cell lysate samples. Specificity: This ELISA kit recognizes Human I Mouse ULK1 phosphorylated at site Serine-556 as well as total ULK1. Prepare all reagents and samples as instructed in the manual. Add 100 µl of sample or positive control to each well. Incubate 2.5 h at RT or O/N at 4 °C. 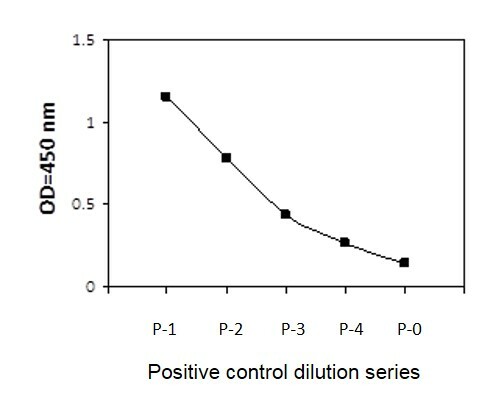 Add 100 µl of prepared primary antibody to each well. Add 100 µl of prepared 1X HRP-Streptavidin to each well. Upon receipt, the kit should be stored at -20 °C. Please use within 6 months from the date of shipment. After initial use, Wash Buffer Concentrate (Item B), Assay Diluent (Item E), TMB One-Step Substrate Reagent (Item H), HRP-Streptavidin (Item G), Stop Solution (Item I) and Cell Lysate Buffer (Item J) should be stored at 4 °C to avoid repeated freeze-thaw cycles. Return unused wells to the pouch containing desiccant pack, reseal along entire edge and store at -20 °C. Reconstituted Positive Control (Item K) should be stored at -70 °C.